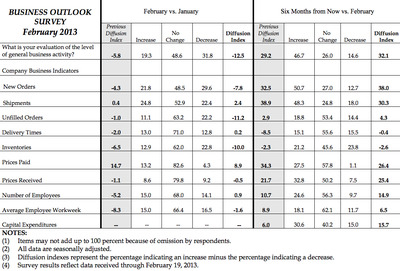 UPDATE: The latest Philly Fed Business Outlook Survey is out. The headline index unexpectedly fell to -12.5 from last month’s -5.8 reading. Economists were looking for the index to rise to 1. The drop was led by declines in new orders, unfilled orders, and inventories. According to the release, though, the data are a bit more mixed than the headline index reading suggests. The survey’s broadest measure of manufacturing conditions, the diffusion index of current activity, decreased from a reading -5.8 in January to -12.5 this month (see Chart). * The demand for manufactured goods also showed slight declines this month: The new orders index declined from a reading of -4.3 in January to -7.8 in February. Despite negative readings for general activity and new orders, the shipments index showed improvement: The index remained positive and edged slightly higher to 2.4. The percentage of firms reporting increased shipments (25 per cent) was slightly greater than the percentage reporting declines (22 per cent). labour market conditions showed signs of stabilizing this month. The employment index increased from -5.2 in January to 0.9 this month, its first positive reading in eight months. The percentage of firms reporting employment increases (15 per cent) narrowly exceeded the percentage reporting decreases (14 per cent). The survey’s future indicators suggest that firms expect recent declines to be temporary. The future general activity index increased from a reading of 29.2 to 32.1, its third consecutive monthly increase (see Chart). The percentage expecting increases in activity over the next six months (47 per cent) exceeded the percentage expecting decreases (15 per cent). The indexes for future new orders and shipments showed a mixed pattern this month. The future new orders index increased 6 points, while the future shipments index fell 9 points. 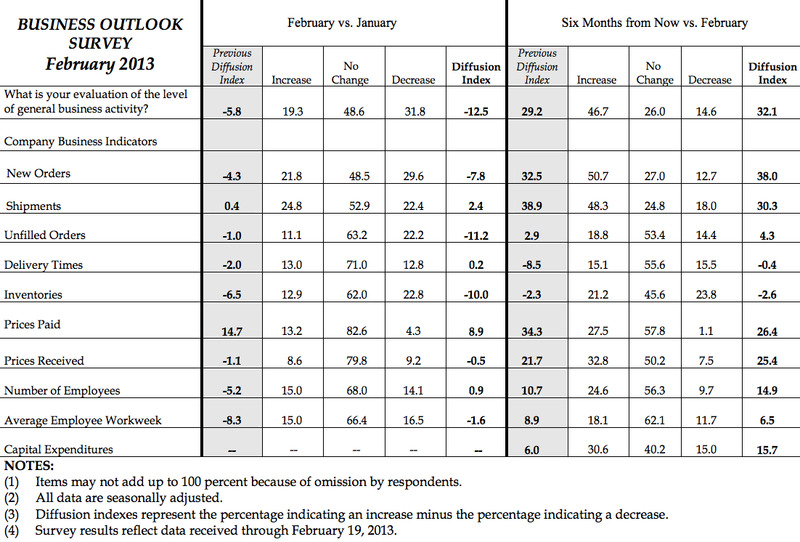 The future employment index improved modestly, increasing from 10.7 to 14.9. 20-five per cent of firms expect to increase employment over the next six months; 10 per cent expect to decrease it. In special questions this month, firms were asked about their expectations for production growth for the first quarter (see Special Questions). Nearly 54 per cent of the firms expect increases in production in the first quarter; 25 per cent expect decreases. Nearly 47 per cent of the firms said first quarter production growth would represent an acceleration in growth (only 9 per cent characterised it as “significant acceleration”; 38 per cent said the expected growth represented “some acceleration”). ORIGINAL: Minutes away from the release of the February Philly Fed Business Outlook Survey, due out at 10 AM ET. Economists expect the headline index to increase to 1. Last month, the index contracted sharply to -5.8 on broad-based weakness from a prior reading of 4.6. Economists were expecting it to rise to 5.6.